She studied philosophy at the University of Rome, during which she published a book of sensual poems that shocked her conservative family. I tried to find some of her poems but was unable to. Elsa led a refined life with a certain amount of luxury provided by her parents’ wealth and high social status. she started her own business but it closed in 1926 despite favourable reviews. She launched a new collection of knitwear in early 1927 using a special double layered stitch created by Armenian refugees and featuring sweaters with surrealist trompe l’oeil images. Although her first designs appeared in Vogue, the business really took off with a pattern that gave the impression of a scarf wrapped around the wearer’s neck. The “pour le Sport” collection expanded the following year to include bathing suits, skiwear and linen dresses. 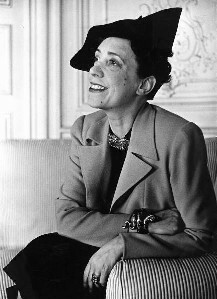 Schiaparelli was an innovative woman and fashion designer. She had a lot of “firsts” in the fashion industry. Her career began with her introduction of graphic knitwear to the world of fashion with knit patterns and emblems. These led to her fanciful prints of body parts, food, and many more unusual themes. She was the first to use brightly colored zippers, appearing first on her sportswear in 1930 and again five years later on her evening dresses. Not only was she the first to use brightly colored zippers, but she was also the first to have them dyed to match the material used in her garments. She was the first to create and use fanciful buttons that looked more like brooches. They came in the shapes of peanuts, bees, and even ram’s heads. In Parisian fashion, she invented culottes, introduced Arab breeches, embroidered shirts, wrapped turbans, pompom-rimmed hats, barbaric belts, the “wedge,” a soled she that would trend through the 20th century and into the next, and mix-and-match sportswear, the concept of which would not be fully recognized for another forty to fifty years. While her innovations in fashion design were numerous, it was her creation of the runway show as we know it today that was most influential. Her modern idea of a fashion show included a runway with music and art, and the use of elongated, shapeless women as models. She believed that this boyish figure would best display the clothing. Many people do not realize the true sum of her impact on fashion and the fashion industry. The 1937 Lobster Dress was a simple white silk evening dress with a crimson waistband featuring a large lobster painted (by Dali) onto the skirt. From 1934, Dali had started incorporating lobsters into his work, including New York Dream-Man Finds Lobster in Place of Phone shown in the magazine American Weekly in 1935, and the mixed-media Lobster Telephone (1936). His design for Schiaparelli was interpreted into a fabric print by the leading silk designer Sache. It was famously worn by Wallis Simpson in a series of photographs by Cecil Beaton taken at the Château de Candé shortly before her marriage to Edward VIII. The Tears Dress, a slender pale blue evening gown printed with a Dali design of trompe l’oeil rips and tears, worn with a thigh-length veil with “real” tears carefully cut out and lined in pink and magenta, was part of the February 1938 Circus Collection. The print was intended to give the illusion of torn animal flesh, the tears printed to represent fur on the reverse of the fabric and suggest that the dress was made of animal pelts turned inside out. Figures in ripped, skin-tight clothing suggesting flayed flesh appeared in three of Dali’s 1936 paintings, one of which, Necrophiliac Springtime, was owned by Schiaparelli; the other two are The Dream Places A Hand on a Man’s Shoulder and Three Young Surrealist Women Holding in Their Arms the Skins of an Orchestra. In 1933, Dali was photographed by his wife Gala Dali with one of her slippers balanced on his head. In 1937 he sketched designs for a shoe hat for Schiaparelli, which she featured in her Fall-Winter 1937-38 collection. The hat, shaped like a woman’s high heeled shoe, had the heel standing straight up and the toe tilted over the wearer’s forehead. 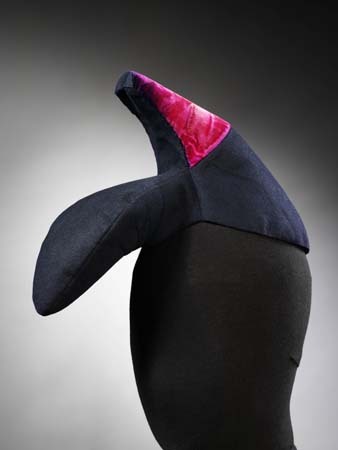 This hat was worn by Gala Dali, Schiaparelli herself, and by the Franco-American editor of the French Harper’s Bazaar, heiress Daisy Fellowes, who was one of Schiaparelli’s best clients.